Vaccination rates dropped after a flawed study linked the shot to autism. Catch-up clinics are being held. LONDON — More than a decade ago, British parents refused to give measles shots to at least a million children because of now-discredited research that linked the vaccine to autism. Now, health officials are scrambling to catch up and stop a growing epidemic of the contagious disease. This year, the U.K. has had more than 1,200 cases of measles, after a record number of nearly 2,000 cases last year. The country once recorded only several dozen cases every year. Last month, emergency vaccination clinics were held every weekend in Wales, the epicenter of the outbreak. Immunization drives also have started elsewhere in the country, with officials aiming to reach 1 million children aged 10 to 16. “This is the legacy of the Wakefield scare,” said Dr. David Elliman, spokesman for the Royal College of Paediatrics and Child Health, referring to a paper published in 1998 by Andrew Wakefield and colleagues that is widely rejected by scientists. Britain’s top medical board stripped Wakefield of the right to practice medicine in the U.K., ruling that he and two of his colleagues showed a “callous disregard” for the children in the study, subjecting them to unnecessary, invasive tests. As part of his research, Wakefield took blood samples from children at his son’s birthday party, paying them about 5 pounds each, and later joked about the incident. Still, MMR immunization rates plummeted across the U.K. as fearful parents abandoned the vaccine, from rates over 90 percent to 54 percent. Wakefield has won support from parents suspicious of vaccines, including celebrities like Jenny McCarthy, who has an autistic son. Nearly 15 years later, the rumors about MMR are still having an impact. Now there’s “this group of older children who have never been immunized who are a large pool of infections,” Elliman said. The majority of those getting sick in the U.K. — including a significant number of older children and teens — had never been vaccinated. Almost 20 of the more than 100 seriously ill children have been hospitalized and 15 have suffered complications including pneumonia and meningitis. One adult with measles has died, though it’s unclear if it was the disease that killed him. Unlike in the United States, where most states require children to be vaccinated against measles before starting school, no such regulations exist in Britain. 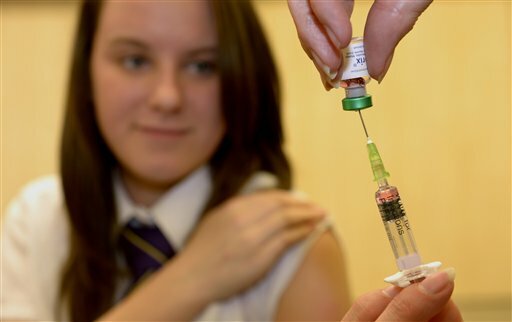 Parents are advised to have their children immunized, but Britain’s Department of Health said it had no plans to consider introducing mandatory vaccination. “They see what’s happening in Wales, so some of them are now sensible enough to come in and get their children vaccinated,” she said. Clinic patient Ellen Christensen, mother of an infant son, acknowledged she had previously had some “irrational qualms” about the MMR vaccine. “But after reading more about it, I know now that immunization is not only good for your own child, it’s good for everyone,” she said.